Pre Season Training for Pole Vault. Despite popular belief, pole vaulters cannot train like sprinters. There have been many pole vaulters from my club who have gone on to colleges where they would do sprint workouts and lifting sessions on Mondays Wednesdays and Fridays, and the pole vault sessions were relegated to Tuesdays and Thursdays which essentially should be recovery days. In the long run, this will cause little improvement in the vaulter’s technique, max efforts in grip, push, and pole stiffness, and most importantly lead to run-throughs. Below I have outlined a typical Pre or early season workout schedule that focuses on volume. But ultimately as the season goes on any jumping, sprinting, and lifting should be lower volume and higher intensity. A word on intensity level in the pole vault. The way a coach can manage intensity and volume is by the approaches you have athletes take in practice. When in early season make sure to keep the intensity low with 1,2,3,4, and for the advanced 5 left approaches. At these length approaches athletes will not be hitting top end speed and you can prevent central nervous system fatigue while being able to do a higher volume of jumps 20-30 jumps in a session working out technical issues. I have even seen very fit athletic athletes take over 40 jumps in a session. Once you are peaking later in the season you can use 6,7,8,9 or 10 lefts approaches and most athletes will take 7-20 jumps at most. These jumps would have a higher demand on the central nervous system, but certainly, the volume must be taken down. These jump sessions must be followed with at least three days of active rest before attempting to vault again from a full approach in order to allow the central nervous system time for a full recovery. I sometimes throw in a 4 step jumping drill without a pole to teach the athlete how to jump up properly with a penultimate step. Athletes will perform 20-30 jumps from a 1left, 2 left and 3 left approach doing various drills: take off only focused on pole speed and jumping up, swing to a sit focusing on keeping the pole speed up and getting the hips past the bottom arm through pulling and landing deep into the pit, and finally swing to the belly where the athlete continues pulling their hips past their bottom arm and then turning and pushing off the top. Wednesdays are run like Mondays and Fridays except the jumping should not be taken past a 1 left approach in order to save the CNS. Also, no sprinting and lifts should be done for 3 sets and be at least 5-10% easier than Monday’s lift. Athletes should bike or jog for 15-20 min, and perform an abs circuit as well. Other restorative exercises like hypers and reverse hypers can also be done. 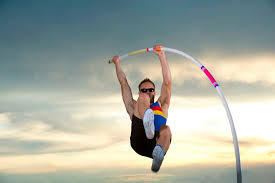 This, of course, is a quick overview of the system we utilize at Apex Vaulting. People can and should make adjustments to this system to fit their program, access to facilities, and specific situations.